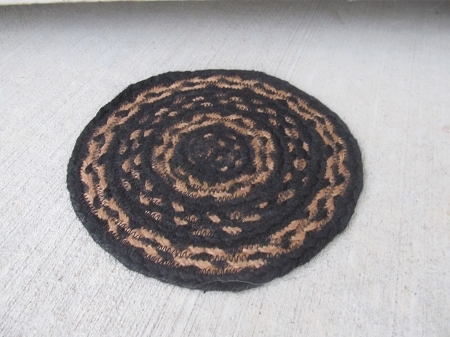 Primitive Farmhouse Black and Tan Braided Jute Trivet. I love braided jute pieces to accent my home's decor. They add great texture and color to your space. This one is the Farmhouse Black and Tan braided jute pattern. 8" diameter. Spot clean. Could also be used as a hot pad/trivet, but really fun to decorate with an anchor a grouping. Place a TIMER candle or jar candle on top, so many possibilities!